We abandoned our plan to stay at the Madera Canyon, Coronado Nat'l Forest campground when we arrived in Green Valley. Night temps predicted to be in the low 20s and highs up to low 40s for 2 days. The first alert note we had was perhaps 1" or more of snow at the higher elevation including the campground. So we opted for a marginal RV park down in the valley, south of Green Valley at Amado, AZ. This is a "Marginal" RV park but new owners and being upgraded. A few warmer days are now past, but tonight dropping into the 20s again. We opted for heading to the SW vs. Florida... well it is winter still here (read cold). If all goes well in D.C. this week and the temper tantrum is abated we will head to Joshua Tree N.P. after a 4 night stay in Quartzsite, AZ. We pull out oif here on Wed. I did plan on providing a more detailed trip report here, but seem to have run out of energy at the end of each wonderful day. We have spent a great 5 nights reuniting with a couple who recently left Belize. While we only logged 25+ years there however they were there 40+. Loads of sharing memories and stories. Like us they are seeking a place to relocated in the U.S. of A. We out of Mich. and they out of Colo. Seem the Green Valley/Tucson area may be far too hot for DW for 3 months (vs. 4.5 too cold in Mich) so we will re-examine Santa Fe, NM. with 4 gentle seasons. Florida may still be in the running to resettle, but too congested with bipedal hominids from the north seasonally. The old Paul Simon song with the refrain "Why is life so hard..." seems to ring true. Just "full time it" and forget brick and mortar? Probably too old now to consider that. Oh well, off to Quartzsite on Wed then Joshua Tree NP. if it is still going to be open. With any luck I will have warm enough temps to paint outside there. More and details and some pix later. 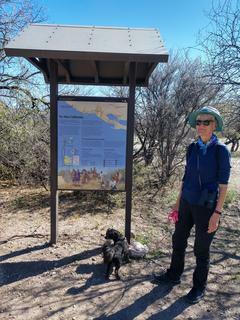 OK one picture of DW & Esme from yesterday as we headed out on part of the Juan Bautista de Anza trail. This trail head was just north of the Tumacácori National Historical Park. Another stamp in the National Park passport! Yes this historic trail ran from Mexico to the Presidio in San Francisco. We only walked 5 miles of it during this trip! Yes mon, wi bi slackers Fo Tru! Although we did walk another more western part in the Anza/ Borrego State Park in Calif. years ago. I think you are going to have to consider this winter in the West an aberation. This is by far the coldest few weeks I've experienced traveling from Vegas to Yuma and all areas in between. Only after Air Conditioning was perfected did Florida get so popular. Same for AZ, Southern CA,& NV. Glad to know you are out there in your new Escape, after all the mishaps you had last year in the, was it a Scamp? This year we were praying you could get out of your driveway! So you haven't mentioned your Escape 19. Hope you love it! We love our 17. Happy Trails! Shopping can be frustrating, but also really exciting. I think that to be in a position to be shopping around for a place to live is really exciting. Not something that happens very often for very many people. Unpredictable weather is the new norm. Expect to not be able to rely on what the climate "used" be like. It may or may not settle into a new, predictable norm at some point, but it's clearly all over the place for the foreseeable future. I'm jealous! I'm planning to get down to the desert, but not for another month. Perhaps you are right. We were thrown out of Joshua Tree for an inch of snow. I guess that that was in the mid or late '70s. Thank you !! I knew there had to be a logical reason somewhere but it has always escaped me . We are now in Qurtzesite, AZ. Cool and wet... very odd for here. Of course there are still skeptics out there that are climate change deniers ... Oh well ignorance of facts and science relates to current political climate that I will not discuss to avoid being deleted from site. We may be looking at Green Valley for a place to roost. 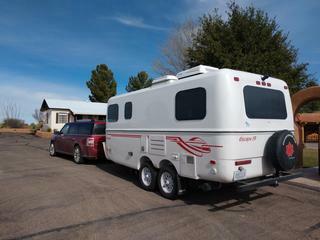 South of Tucson but higher elevation a bit so cooler in the summer by ~ 5 degrees F.
Well Gail... We love our Escape 19. What a difference the 3' make over the 16 Scamp. Still very easily tow-able with our Ford Flex & factory tow package. The key to ANY rig is to avoid overloading the mass (weight). With the Scamp we averaged 15-16 MPG and the Escape is about the same. We just linked up with ahem...Old Friends from Belize both metaphorically and "age." We had an idea they were heading to the SW with their 5th wheel, but not sure what their schedule was with the hopes we might link up now that we were both not only in the same country again but the same time zone. We stopped at a rest stop along I-10 on the way west. DW walked Esme and then visited the ladies room. When she emerged she nearly collided with one half of the couple who were our long time BZE friends. They had recognized the Escape and TV from posts on DW FB page where she chronicles our travels. Now that she no longer had her BZE wildlife blog about her encounters face to face with pumas and jaguars she likes doing the travel log and escapades of Esme. More mundane but still fun. So they knew we were there! I was in the TV and this guy approached the drivers side and rapped on the window with his palm extended. I thought it was some pan-handler as I could only see his torso and arm. When he loudly said "Gimme dolla"
the BZE street beggars call I nearly fell out of my seat. We ended up in Amado, AZ south of Green Valley with our friends for about a week, What fun to catch up after nearly 15 years. I must admit I exceeded a child's portion of rum one night! OMG ...shades of BZE where the various rums were aged from 3 days to a month! One local brand there had a Scarlet Macaw on the label that was locally referred to as "Old Parrot" after awhile it morphed into "Dead Parrot" as it was not very good. However after a few it seemed not to mater so much. Oh well ya only go around once and no one gets out of life alive so a single night of physiological abuse to one's system was survivable. Looks like we will pull out of Quartzsite to Joshua Tree NP Sunday and I will be able to record bats again. I have been remiss in updating RVParky reviews. A few stops clearly not ready for "Prime time" or soon to be awarded any Michelin stars! Howsome ever once the door of the rig is closed all is comforting regardless. No tru? OK time to try to read my e-book from our library, seems I manage only 3 pages per night. Hope to finally get out side and paint at Joshua Tree N.P. To avoid being dictated to by Mother Nature, consider a 4 season trailer. Yep that is why we love our new Escape it is 4 seasons vs the Scamp that was not. Key issue is to combat osteoporosis DW needs to walk 10K steps ~ 5 mile per day and I accompany her and Esme 95% of the time as well as try to record bats (work related endeavors) and paint out side en plein air. Most are not great activities when temps are really low. Nice to sit in the trailer with heater running, but not great for health as "Sitting" is the new smoking as health issues go. So one should be walking /moving every hour for 5-10 minutes as well. Not much walking space even in a 40+ ft Class A LOL. Ecoboost engine or normally aspirated? I may have asked this before, in which I apologize for the answer not sticking in my mind. I have a 2018 Ecoboost Flex but was thinking an Escape 19 had to wait for me to migrate to a Ranger. The Escape 19 is mighty close to all the Flex towing specs. The climate certainly does appear to be changing. The solar minimum with its lack of sunspot activity has begun a rapid temperature drop. It will be interesting to see how many years this trend continues. I'm sure you are happy with the floor space you have, having moved from a Scamp. I went from a 17' motorhome (17' included the cab and engine bay), which had just enough floor space for either me to stand, or the dog to lay. But not both. My 17' Bigfoot is huge by comparison. But yeah...that would be a lot of laps to get any exercise! I've spent a bit of time in cold, snowy weather in my camper. It's fun for approximately one morning or one evening of cold and snow, huddled up with the heater running, enjoying that you're nice and toasty and cozy in your tiny home while it's snowy and cold outside. But after that, it starts getting old pretty quick unless you can get out and enjoy the snow.